In my last Post I requested responses on the idea of initiating an annual nationwide yard sale campaign to help with some of the financial support for the Learning Center. I am encouraged with the various responses received so far. I will highlight a few of these but first, I want to invite everyone who has yet to respond to take a couple minutes to send me a note with your thoughts. Really, this is not asking too much. There are 1,440 minutes in each day and we are only asking for 2 of them. Our motto says “Friends” willing to do a little…much gets done. Remember, your response does not obligate you to do anything. I am only looking for input from you on the idea of establishing a specific week or month annually for “Friends” to be actively engaged in a small fund-raising event. Details of the request for input is in last week’s Post under the sub-heading “Be a Visionary Enabler”. Fun with neighbors while raising money. Regarding the feedback so far, many of the responses indicate strong support for the idea. A couple of responses proposed that using Craig’s List to sell unwanted or unneeded items could be a viable alternative to yard sales for a few. There was input indicating support for the concept for an annual garage sale type event but practical concerns were raised relating to home locations not allowing such activities and issues pertaining to the lack of availability of personal time. One response came from a very exuberant “Friend” who pointed out that she has very little personal inventory and lacks an appropriate location to do a garage sale. But, she is very “pro” garage sales and is wanting to know how to still help. I admit this was the most uplifting response of all. I have not yet received any “negative” responses. Please…take a couple minutes and let me know your thoughts. Your personal comments will be protected. We will wrap up this request after this week and I will report our results and decision to go or not to go. You have at your disposal 1,440 minutes available and I need only 2 of them. THANKS…! We really have been on a very active schedule over the past few months. Again, we blew by another milestone without noticing. We passed the 8,000 hit mark in early July. This covers our total time since December 2013. Also, this means we are on pace to reach our 2016 goal of 3,600 hits. We stand now at 1,839 so far this year. Remember, frequent or consistent visits to the Blog by you contributes to about 85% of our total hits each month. In August the popular Spelling Bee will resume and according to my latest report, we have 3 Learning Center students competing in the 2nd round. We commend Ana for her extra duty being performed since the Learning Center is short one teacher. One of the two teachers on board returned to the states due to professional reasons. This caused a serious hardship for the remaining staff to keep up the educational schedule and productivity. 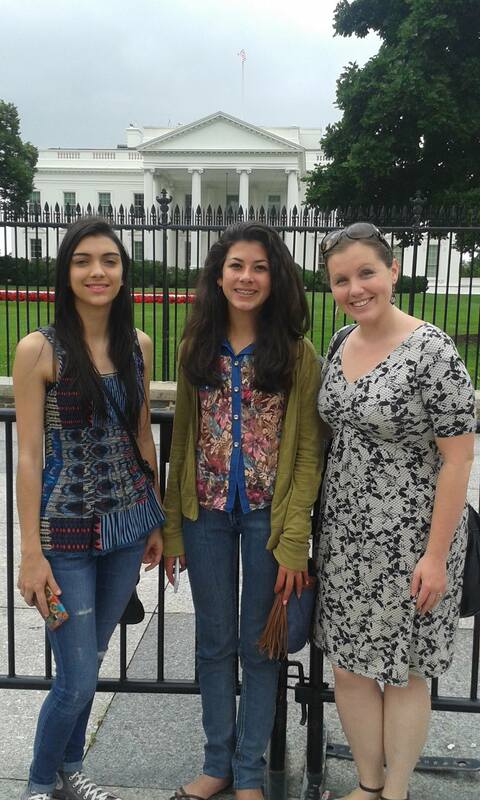 Ana is doing her regular job and is currently part of the teaching team. Anyone among the “Friends” who can hop a plane quickly and get to Copey to teach, is welcomed. I continue to tease you with promises of really great news on the horizon almost each week. This is of course much more than teasing. I listed some of the really great news items last week including our successful fund-raising efforts. There is more good news down the road and when it is confirmed and safe to announce, you will be the first to know. So you are encouraged to keep praying for our success and continue those very “positive” expectations for great things to come our way. Last week while driving past a local church I noticed on their reader board the quote “Aspire to inspire before you expire!” That quote stuck with me most of the day. It connected with me because it seems to express in very brief terms what “Friends of Copey” strives to do. As “Friends of Copey”…we “aspire to inspire”! On this note, I have promised to share some great news this week. 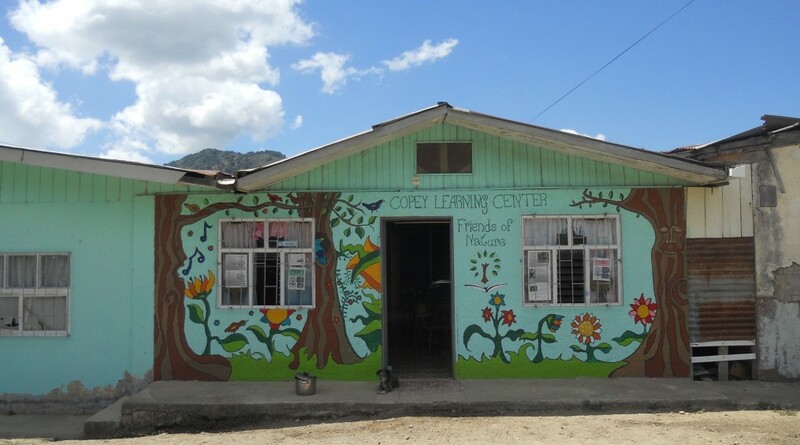 First, the Copey Learning Center just celebrated its 6 year anniversary. The small town of Copey should be very proud of this accomplishment and we are grateful to have been a significant part of this effort and short history. Also, The students just returned to school after a two-week break. When they returned they found fresh paint and a face lift at the Center. Ana, volunteers, and even some students helped to make it a more welcoming environment for the students returning to school. My Kiwanis Club assisted with two small fund-raising events this month in support of “Friends of Copey”. First, a couple of weeks ago, Kiwanis, “Friends”, and our the local outlet of the nationally known REI company, worked together to host a two-day First Aid Training event. This proved to be a very unique and special arrangement since it provided “Friends” the opportunity to support a major company, share information about Kiwanis, the Copey Learning Center, and obtain donations. About 30 training attendees were treated with lunches, food and snacks along with information about “Friends” and our Copey project. One very generous attendee donated $100.00 to support “Friends”. There were numerous other smaller donations made by other attendees. This past week, Kiwanis stepped up again and club members donated numerous items for sell during a one day “Yard Sale”. The yard sale was a success. It provided one more opportunity to share information about “Friends” and the Learning Center. Our popular banner was visibly on display and we also handed out information cards to our customers. Most customers willingly paid the asking price for the items and in a few cases they just made donations. Both events exceeded our original expectations and I personally thank Kiwanis members Martha and Norma, and the rest of the club members for their support. Non-Kiwanis Club members also provided very significant support. Thank you Carol, Pat, and Jim. Within the next few days, “Friends” will donate more than $1,000.00 to the Learning Center. Part of this donation will closeout our commitment in support of the salary for the Executive Director. The balance will be designated to help with school supplies and materials for the balance of this school year. My final note is a huge “Thank You” to my Senior High Class of 66 who recently donated $100.00 to the Anne G. Broady Scholarship Fund. This represents the third AGB Scholarship Fund donation received this summer from my high school friends from Virginia. I sincerely hope each classmate will follow my Blog and see the progress being made over the next few months and the year. We continue to do what we set out to do and we have much to be proud of. As many of you know, I am a hopeless visionary. I have been wondering how many “Friends” from all parts of our country occasionally engage in yard sales or garage sales? I wondered if I could encourage (inspire) enough “Friends” (two or more) to host a local one or two-day yard sale on behalf of “Friends of Copey” right in your own neighborhood? We could get really adventurous and set aside one month each year to host a national “yard sale” event on behalf of the Learning Center. Please, let’s start some discussion on this idea. I sincerely encourage your feedback on this concept. I know typically most of you who read the Posts just do so for information only. BUT…this is a request for your input. I am the one needing information. Here is one small way to be a little more active beyond reading my Posts. I know there are several of you out there in “Friends” land who wonder at times what small thing can I do to help. “Friends” can help from anywhere! No commitments…just asking for feedback. THANKS! Busy Week…And Life Moves On! “Friends”…this has been one very busy week attending a conference. Before the week started, I was involved in a fund-raising activity for the “Friends of Copey”. The results were very good and I will discuss this in more detail in my next Post scheduled for this coming Monday. I thought there would be some down time over the past weekend to prepare and submit my weekly Post scheduled this past Monday but that just did not happen. This actually worked out fine since the Learning Center has been closed last week and this week for their annual mid-year break. As a result, there is not much news to report at this time out of Copey. Things will start running again on Monday and we will be back on schedule. What kind of organization is “Friends”? Very simply, we are a very unique and non-traditional organization. There are no officers, no meetings, no minutes, and no administrative costs. By design, we are merely a collection of “friends” who share a common interest in the educational well-being of kids in the small rural community of Copey, Costa Rica. I estimate there are 150 total regular followers of this Blog. Over the three plus years using the Blog, there has been a steady increase in followers but at the same time, followers move and are no longer interested. This is all very natural. 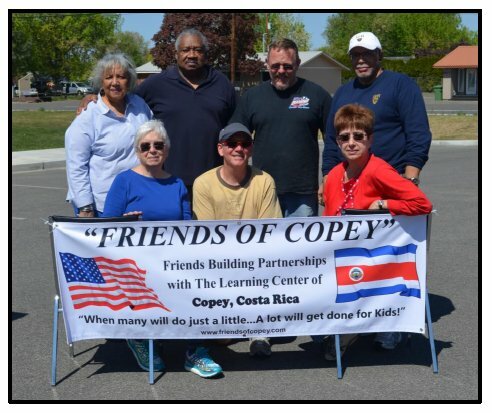 Are there membership fees or dues required to be a “Friend of Copey”? There are no membership fees or dues. In fact, there is no obligation to spend any personal funds to support the Learning Center. There are many different ways to support our efforts since more than 70% of our support is non-financial. If there are no fees or dues required, how does “Friends of Copey” obtain the funds to support some of the projects? I would like to say it is “Just Magic”. But the answer is much more than that. A far better response would be “Just Miracles” instead. “Friends of Copey”, especially for those closest to the everyday experiences, know things happen at times without explanation. Although many of the “Friends” are “believers” and support this project with their prayers, we also have other “Friends” more orientated towards strong positive thinking. Both believe that we can accomplish great things. Then, we are also blessed to have “Friends” who may be prayer warriors and/or positive thinkers, but who also feel inclined to make donations to support one or more of our financial needs. I assure you that after three plus years, it takes all three types of “Friends” to do what we do and accomplish what we have so far. 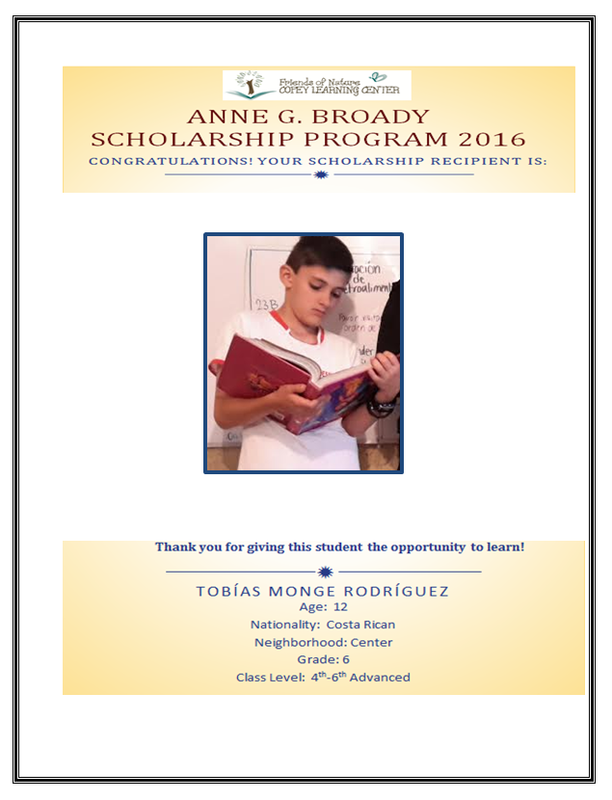 Annually, we request and receive donations to support our Anne G. Broady Scholarship program. We also receive donations to help cover part of the Executive Director’s salary. At other times during the year we receive donations to help with school supplies and materials. This Spring we conducted a very special fund-raiser to obtain the funds to cover the travel expenses for our three guests from Copey to travel the USA. One hundred percent of the donations received goes directly to the Learning Center or to support projects. We are extremely proud of being different. The money raised represents about 30% of the support we provide. 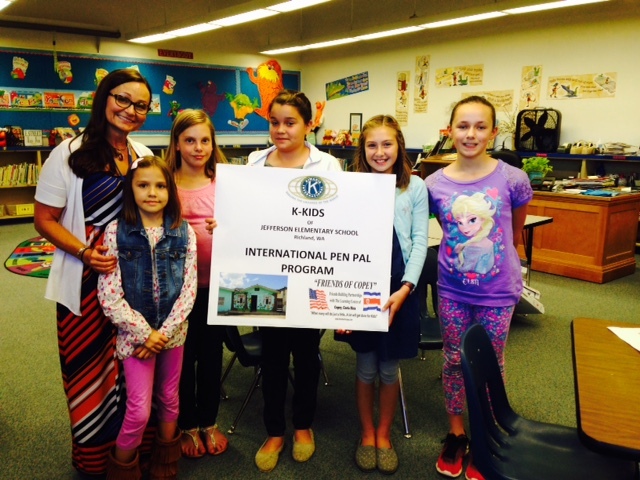 Our non-financial support includes wonderful special projects involving communications directly between American and Costa Rican students such as our popular Pen Pal Programs. We also help to arrange for college students to go to Copey to provide needed volunteer service to the Learning Center. The Menu button above “Frequently Asked Questions” provides many answers about our short history and goals. I invite all new “Friends” to visit the section and become an informed and involved “Friend”. If there is no answer provided to a question, please contact me directly atbroady@aol.com.